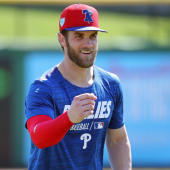 Alvarez signed a minor-league contract with the Marlins on Monday which includes an invitation to spring training, Joe Frisaro of MLB.com reports. There are few organizations easier to battle for a roster spot with than the Marlins, but even so, Alvarez doesn't necessarily have an inside shot. He's primarily a designated hitter, having started just 13 games in the field over the last two seasons. He no longer appears to have the bat capable of carrying his value as a bat-only player, though, as he hit just .180/.283/.414 in 45 games with the Orioles last season. Some positive regression from his .179 BABIP could help, but he'll be 32 years old next season and the rebuilding Marlins will likely prefer to give playing time to younger players.